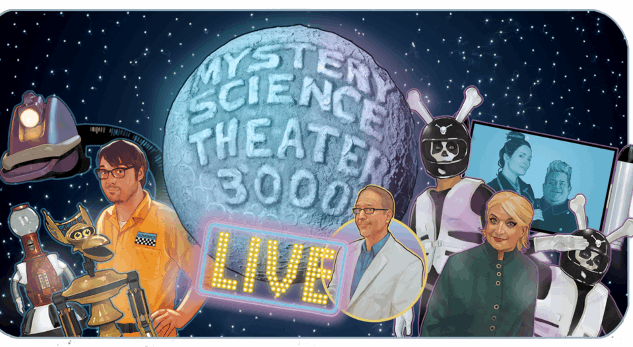 Big news today for faithful MSTies, courtesy of MST3K creator Joel Hodgson: Mystery Science Theater 3000 is going on the road for a summer tour! The revived Netflix series is embarking on the sort of cross-country love-in that the original series never really had a chance to pull together, with members of the new cast riffing two different films in each location. The tour will be a valuable opportunity for MST3K fans new and old to see members of the new cast in action, riffing in a significantly different setting than on the TV series. New “guy stranded in space” Jonah Ray will anchor the new riff as he does on the show, joined by the new Crow (Hampton Yount), Tom Servo (Baron Vaughn) and Gypsy (Rebecca Hanson). Hodgson will also be traveling with the show as director and emcee, so don’t worry, old-school MST3K fans—you will surely have some time with Papa Joel. Films riffed during the tour will include the classic Joel episode Eegah!, which we recently ranked at #17 out of 177 in our ranking of every original MST3K episode. That California caveman yarn, starring Richard “Jaws” Kiel, also provides the tour with its “Watch out for snakes!” name, in reference to the below-embedded moment of abject confusion from the film. The second film of each performance will be even more exciting to many fans, myself included, because it’s a mystery feature that Joel describes only as “a truly weird sci-fi thriller” that has never been featured on MST3K before. Sign us up for THAT. Tickets for the tour will first be made available to backers of the MST3K Kickstarter drive that raised more than $6 million for the show’s return, before opening to the general public. Further ticketing and sales information, along with complete tour dates, are available at the tour’s main website. Hodgson goes on to describe the tour as a project that will keep both the on-screen and off-screen staff busy and sharpening their MST3K abilities as they wait for some kind of news or confirmation from Netflix on the possibilities of a season 12 for MST3K. These possibilities are presumably being based on the viewer numbers for season 11, so if you want to see additional seasons of MST3K on Netflix, be sure to fire up your account and let them know. Below, check out the trailer for the tour itself, and the official poster by Steve Vance.